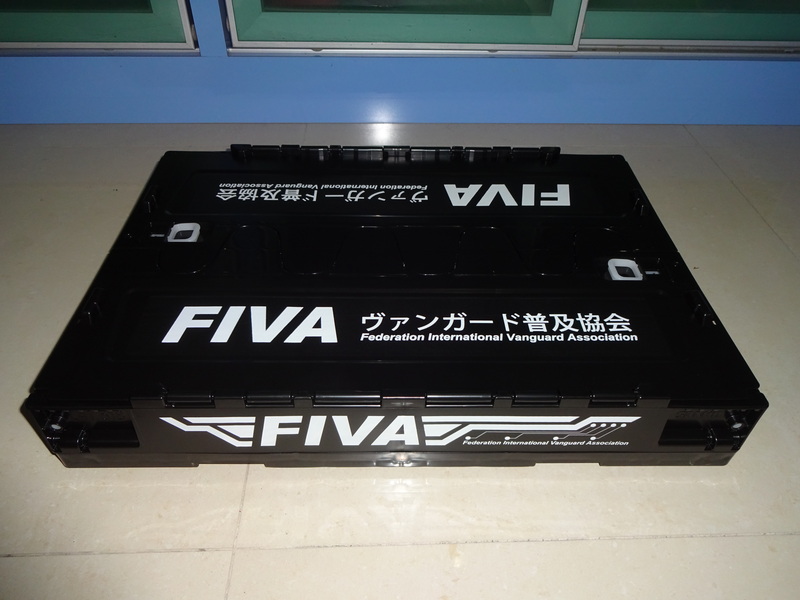 This is the FIVA Foldable Container. 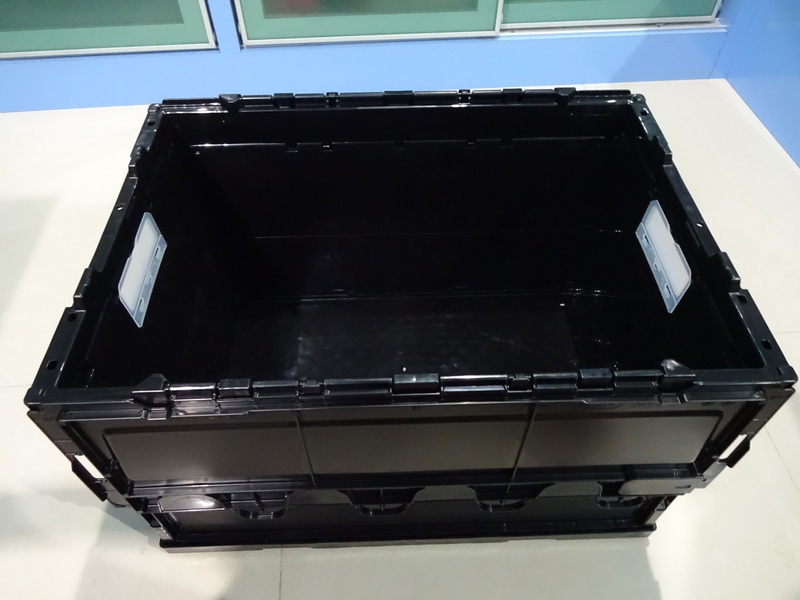 A 53cm by 36.6cm by 33.4cm PP plastic container made of PP and LDPE. In other words, it is a plastic box. Now I know it seems like I’m bashing on this. To be fair and critical about it, it is a box. And there are various uses that a box can do. (A quote made famous by a certain Master of the Cardboard Box). For various uses in terms of Vanguard, it is an excellent container to keep all of your collection of common and rare cards you have procured from buying BTs, EBs, TDs and… what other acronyms have Vanguard put out over its long years? It is a very sizable container. Below is a comparison we have of the amount of space it has. 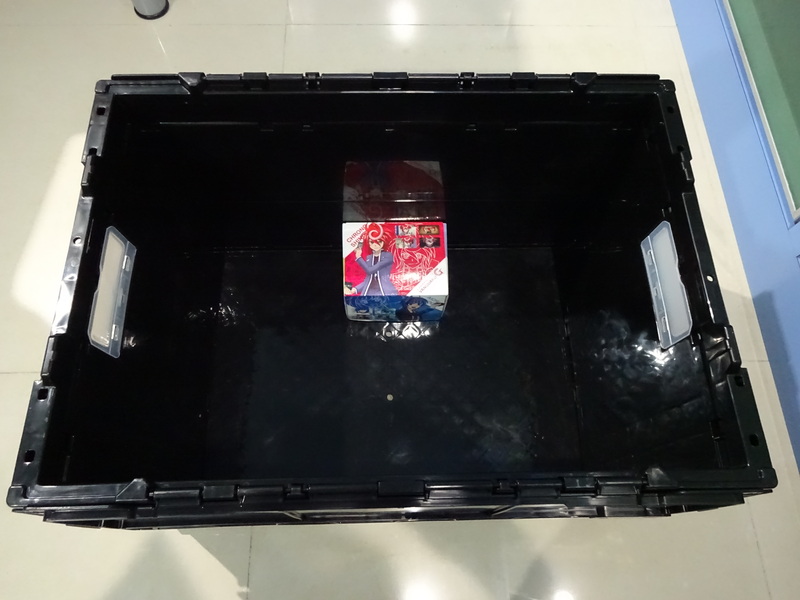 With the Cardfight Vanguard G deck container box as comparison, you can pretty much see how spacious the FIVA Foldable Container is. There is a lot of room inside and is an excellent storage container. Card Shops could choose to invest in this to store all discarded cards from customers buying packs in one place. With self-made dividers, it can be easy to organize everything, and then bring it out onto a play table and have people interested in them to sort through and look. Just make sure they organise it back. The foldable aspect of the container is nothing noteworthy. Given this product’s purpose, its only used when you first received it in the packaging and when you aren’t using it. 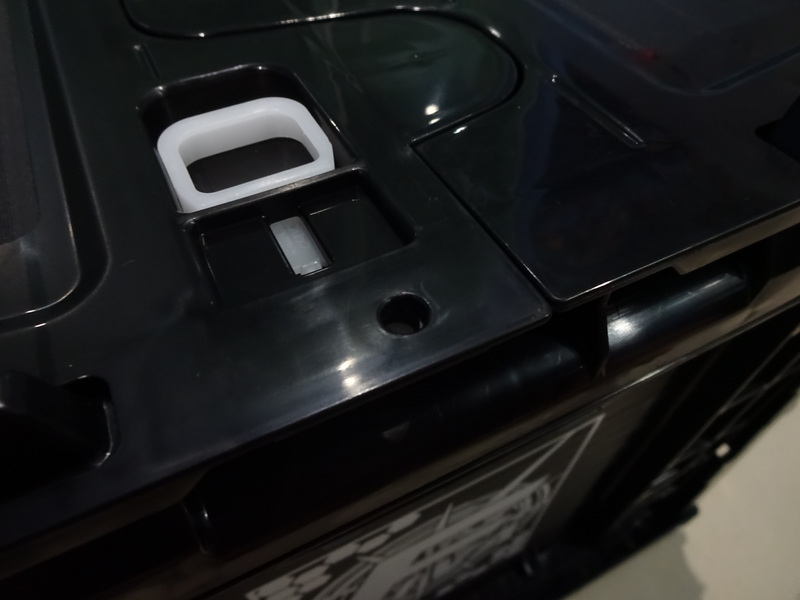 But despite that, the FIVA Foldable Container comes with a lid, so you can keep your collection dust free. But its not waterproof, as there are holes around the box. Here We have a closeup of the latch they use for the lid of the box, in case you were curious. There are two of them, one on each side of the box. Its a simple system, and unlatching them will open the box. There are covered slots on each side of the box to carry it around. The coverings are just plastics to bar out dust and unwanted entrants looking for a warm and dark home. Personally, after all that is said, I would liken this to a treasure chest. A horde of collectable cards. I can imagine this being used in an official Cardfight Vanguard Live Action movie, with your generic gold aura shine around it in one shot to signify its glory of potentiality. If you were to find this, what secrets could you draw out from this FIVA Foldable Container, filled with possibly hundred of cards? But it’s Just! A Box! We expected much from this product, and it let us down. At least for me, I was expecting built in features like shelving, dividers to separate the box on a vertical and horizontal scale. In fact, I had expected it to be a carry-on where you can keep your decks inside and bring it for your meetup with friends or bring to a tournament and be like a certain fictional card player popularly known for being rich enough to break the rules-ahem…. An idea I thought up as I opened the lid of the FIVA Foldable Container while it was folded is the fact that it sort of looks like a field that you can play on. With an increased size and that aforementioned divider, with some other accessories, it can become a table you can play Vanguard on, and bring anywhere with you. Beats playing on the floor while waiting for a Vanguard event to be open to the public, I assure you. Because it is a box, there’s so much potentiality that this product can do. And I like to think that someone somewhere has the same ideas that Dempster, Leon, and I had when we checked this out for the first time, thinking of all the things that this could have been. Nope, it’s just. A box. And my final rating for the FIVA Foldable Container is a 5/10. 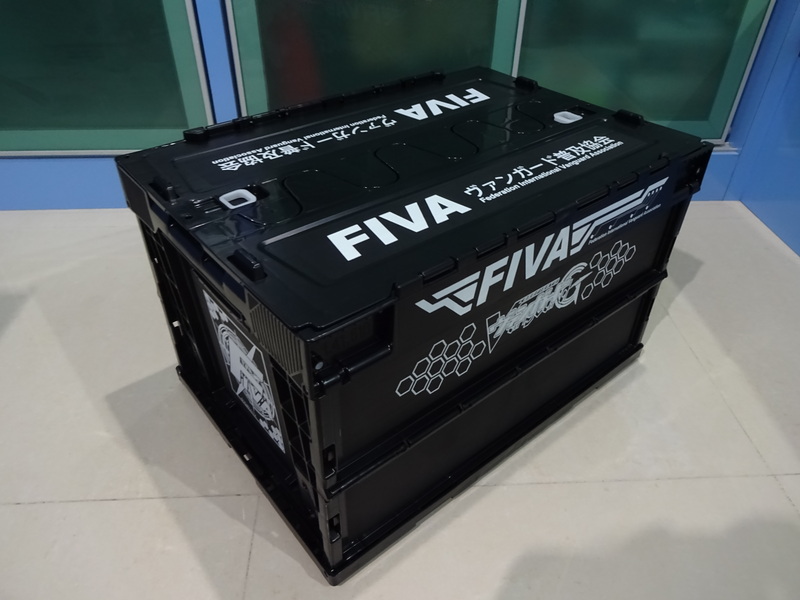 For reasons as made clear, merits of the FIVA Foldable Container mainly goes to the fact that it’s a box that you can put things in. It’s barely possible to carry this around. We dare not test out its durability, but it is assumed that it can carry the mass of hundreds of common cards for transport. It is designed well, but save the lid, it borrows heavily from an item I have called the Yellow Box, that is used in the film industry to store and transport small objects like lights and grip items like clamps. it does as it is intended to do, and that’s the best merit it has going for it. If you’re someone who wants to create a dedicated container for all your cards and you are a big fan of all things Vanguard like us, this item is for you. But only if you are willing to part the coin for it, as it goes for about SGD$70 minus shipping.